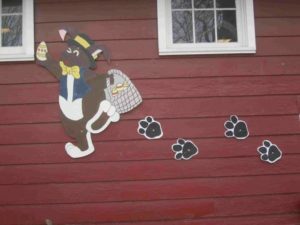 Celebrate the arrival of spring at Terhune Orchards’ Bunny Chase on Easter weekend. Spring has sprung at Terhune Orchards! The farm animals are enjoying spring in the pasture and the bulbs are blooming. Come for a fun event for all young ones and their families. Follow the treasure hunt clues around the farm, discovering the spring! Wonderful for children ages 2 – 8 years. At the end of the hunt, bunny craft activities and meeting the real Terhune bunnies available for a $5 charge. Enjoy wagon rides around the farm and pony rides too. Hungry? Our Farm Food Tent will be filled with homemade goodies including donuts, pie, cookies, apple cider, soup, chili, salads, hot dogs and much more. Adults visit our Terhune Orchards Vineyard and Winery Tasting Room to sample our award-winning wines made from grapes grown right here on the farm. Fun event for all ages.